Customizing Shells, Anyone try it? I was wondering if anyone ever tried to customize their own shells. Similar to how you can buy them with dolphins, spots, stripes, and palm trees engraved on them. I was thinking that may be something to try to pass some time during our hour lunch break at work. Plus I can never find the Skull and Cross Bones or Flame designs. I'm guessing a Dremel or engraver would work, along with a steady hand and a dust mask. Re: Customizing Shells, Anyone try it? Motörcrab wrote: I was wondering if anyone ever tried to customize their own shells. Similar to how you can buy them with dolphins, spots, stripes, and palm trees engraved on them. I was thinking that may be something to try to pass some time during our hour lunch break at work. Plus I can never find the Skull and Cross Bones or Flame designs. People have DIY'd with Dremels, but afaik it can be time consuming and messy. Some had trouble gauging how much of the shell layers to remove before thinning it out too much or punching through but if you have spare shells, a Dremel, and a Vogmask then go for it. 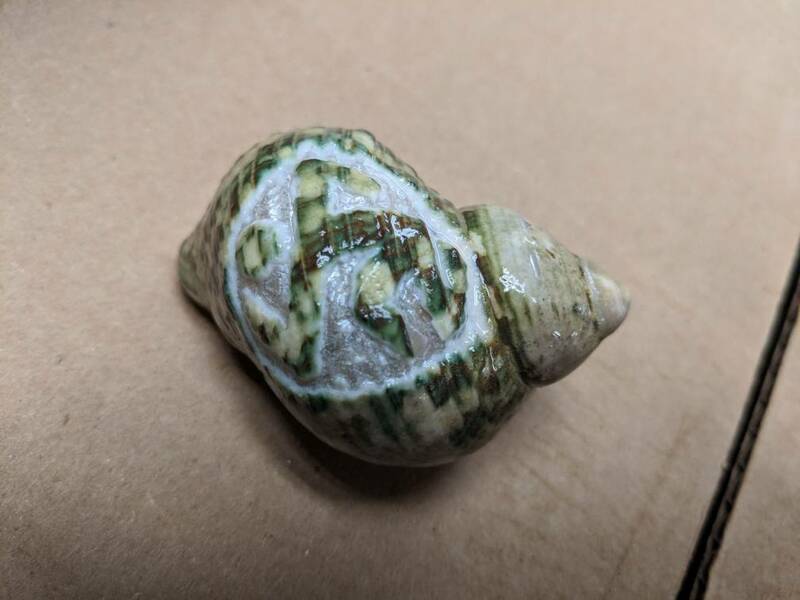 We had a member on here that dremmeled some gorgeous shells. I adopted her crabs and acquired them. She did a rose on one, and a miscellaneous design on the other. They turned out gorgeous! At one point she had set up a shop to customize shells, but I don’t think it was successful. I think it could be fun to do a shell every other week, or maybe once a month. Depending how detailed you get I bet some could take several hours. There is no way you could compete with the engraved shells you can already buy. Plus no one wants to wait more than a few days to receive something ordered online. Here is a quick 20 minute attempt at my first customized shell. It's the logo of the crossover thrash band D.R.I. (Dirty Rotten Imbiciles). I just used an engraver free hand at work on a shell that had a hole on the bottom. A bit rough but has potential! Thanks, I was thinking of starting with the Crab (Black) Flag logo,but figured that would be pretty easy. Maybe I'll try the Slayer pentagram logo on the weekend. I'd love to do the Exploited's mohawk skeleton but that will take some practice, and better precision tools. My ultimate goal is to do Motöhead's warpig on a shell! Hermit crab shells may be the very last item that Kiss did not try to market and sell, although I would never make them for two reasons, 1. I can't stand Kiss 2. I don't want to get a cease and desist from Gene Simmons although I would find it hysterical!